Focusing on projects that don't require the use of a potter's wheel, the new Extended Edition of Handbuilt Pottery Techniques Revealed is bigger and better than ever before. 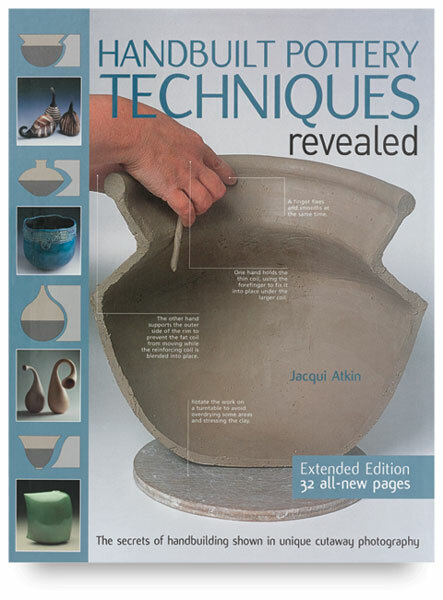 This very popular how-to book for potters covers methods for making pots, bowls, vases, tiles, and other decorative pieces using coil, slab, mold, and pinch techniques. 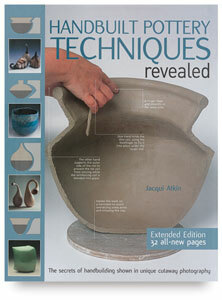 From the basic tools the potter needs to mixing and preparing clay, this book takes the mystery out of hand-building. Hundreds of color photos with detailed captions guide crafters through each project from start to finish. Many photos are of the cutaway type to show correct hand positions for controlling the clay, both inside and outside of the form. The Extended Edition includes 32 additional pages of projects plus an expanded gallery showing examples of finished pieces. Paperback. 192 pages. 8½" × 11" (22 cm × 28 cm).